For most Latter-day Saints, and I suppose for much of the Christian world, Abraham's attempted sacrifice of his son Isaac is viewed as analogy and example prefiguring the death of Christ--just as God would ache with the sacrifice of his beloved Son, so would Abraham suffer the pain of envision the sacrifice of his own beloved child. Furthermore, there is a moral attached to this story: that we, like Abraham, must be willing to make difficult sacrifices to show our devotion to God. While this story may certainly evoke the emotions that God or any loving parent may feel at the prospect of their child suffering or dying, and it may give us the courage to do that which is difficult, I think perhaps that we as Christians misunderstand what this story ought to teach us, and perhaps do so in a way opposite of how we ought to appropriate it in our own lives. The sacrifice of burnt offerings plays a significant role throughout much of the Old Testament, but unfortunately we too often have a gross misunderstanding of what these sacrifices entailed. Sacrifices were not the killing of animals to appease God. Neither were they killed as a proxy for our sinful selves. (In fact, the only animal that sins were symbolically transferred to, the scape goat, was explicitly not killed.) Rather these sacrifices were viewed as symbolic meals shared with God, where the death of the animal was simply a necessary step in meal preparation. (Try throwing a whole, living steer onto your barbecue and you'll understand why.) Through the burning of these meals on the altar (certain grains were permitted if one could not afford meat) the food would rise through the smoke and be taken to God. The remaining meat would be cooked and eaten by the person offering the sacrificial meal (or by the priest acting as proxy in his stead). To understand the significance of such a sacrificial meal, we need to only look at our own gatherings with friends and families. What is almost always there? Food. Family dinners, meet-and-greats, linger-longers, much-and-mingles, business lunches, and dates--they are almost always done over food. Far from being just the consumption of food for nutrition and calories, meals for virtually all of human history have been social activities where friends and families come together. And, of course, if the meal is intended to build relationships, you will want to make it impressive. Want to impress your date? You don't take them to McDonald's; you take them to somewhere stylish, expensive, and/or hip. And Denny's will not work for the business client you are trying to get. The social roles that meals play become even clearer when we go back to times and cultures where food would often be scarce. In such situations, food--especially good food--becomes a commodity that you only share with close friends and family. This is why Jesus's own parables often involved feasts and meals. To be invited to a meal meant that you were accepted and that a relationship with you was either had or desired by those hosting the meal. This was the purpose of a sacrifice. It was not about killing the animal, it was about offering a meal to God with the hope that it was accepted. Or , in other words, it was about seeking or reaffirming a relationship with God with the hope that the desire for a relationship was reciprocated. And to show that you are serious about this relationship, you invite God to the best meal you can offer: the choice of your flock. In light of this understanding of sacrifice, Abraham's attempted sacrifice of Isaac should seem troubling now. Assuming that Abraham was not planning on serving up a rack of his son's ribs with some A-1 sauce and buttered rolls, this sacrifice would not have been a meal shared with the divine but would have been the killing of his son to appease God. While I said earlier that sacrifices were always portrayed as meals shared with God, there is key story in Abraham's own life where another killing was attempted as a sign of devotion to the divine: the near murder of Abraham by his own father and the priests of Elkenah. There is no doubt that Abraham was a righteous man, but he was a just a man. And like the rest of us he almost certainly struggled with understanding the will of God. Could his belief that God desired him to sacrifice his own son have been the result of his own mistaken misappropriation of religious customs of his day? As related in the Book of Abraham, the sacrifice of men, women, and children were ways in which those around him would attempt to please their gods. Just as we are all influenced by our culture, it is easy to imagine that Abraham, while desiring to please God and do His will, mistakingly believed that a sacrifice of his own son was precisely the way to prove his devotion. And yet, the sacrifice of Isaac is explicitly what God intervened and stopped. As Abraham stood, knife in hand, on a mount he would later call Jehovah-jireh, there is an act of saving grace. Like Christ stopping Saul on the road to Damascus, the angel stopping Alma and the sons of Mosiah from "murder[ing] many . . . children" (Alma 36:14), the Christmas star stopping the murderous Nephites, and the risen Christ stopping the murderous Nephites once again, an angel steps in and saves Abraham from sacrificing his son on the altar of ungodly worship. Abraham's desire was righteous, but his application of that desire was grossly misdirected. This is not the sacrifice that God desires. He does not ask us to kill and harm those we ought to love. No, he asks us to love those he loves. Just as he loves us. "Lay not thine hand upon the lad, neither do thou any thing unto him." The sacrifice of Isaac is rejected by God, and thus he is not representative of Christ. No, he is representative of all those who are sacrificed by good-intentioned but woefully misguided persons--sacrifices rejected by God. It is at this intercession that the symbol of Christ emerges. As Abraham lowers his shaking hand, relieved at the harm he was set to inflict on the person he loved, there is a ram caught in a thicket. Earlier that day, as Abraham and Isaac began the trek up the mountain, Isaac inquired his father concerning their lacking an animal for their sacrificial meal. Abraham lied to his son about his intents, telling him that "God will provide himself a lamb." Little did he know at the time that God would be doing just that. God did, in fact, provide a meal for them, but this meal was also different from those generally prescribed throughout the Hebrew scriptures. Whereas sacrifices would normally involve a person providing the best of their flock with the hope of assuring their relationship with God, on the place that would be called Jehovah-jireh (meaning: in the mount of the Lord it will be provided) God provided Abraham with the animal for their meal. Are we, like Abraham, appropriating the religious beliefs and practices of our broader culture as we desire to please God? Are we sacrificing those that we love and ought to love on mistaken altars of worship? 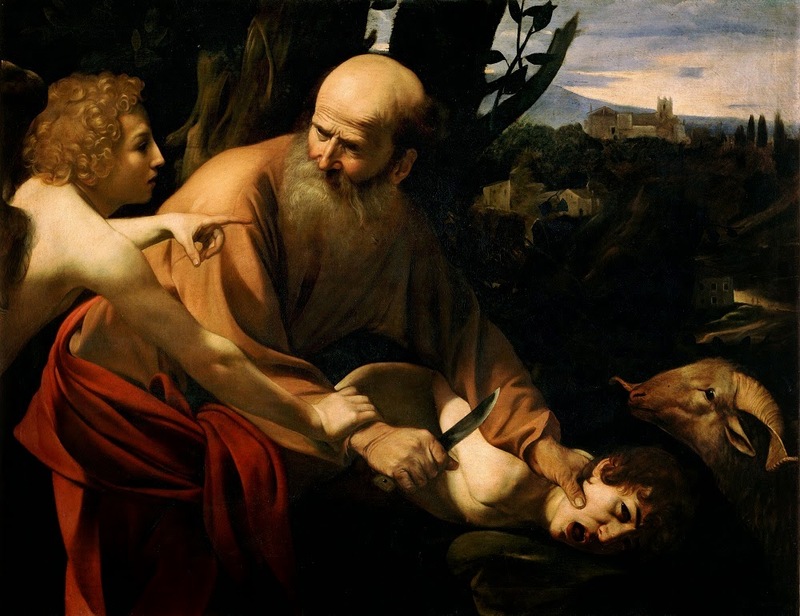 Abraham, in his desire to prove his devotion to God, was willing to kill his son. Unfortunately, we hear too often of fathers and mothers who, like Abraham, sacrifice their LGBT children by kicking them out of their homes. We hear of friends and siblings who cut off communication with those who lose faith. We see self-appointed defenders of the faith demonize those who should be friends. Progressives and liberals, too, are shattering the community and demonizing others in their efforts to prove devotion to their righteous causes. Actual and future families are attacked to prove devotion to an idea of The Family. In the past and still today, we have sacrificed the hopes and desires of our black brothers and sisters, of our interracial couples, of those who differ from us politically. We have kicked and pushed scholars our of our communities, and we have trampled those we think naive under our intellectual feet. Like Abraham we have begun to believe that true devotion is proven in the willingness to harm others. Like Abraham, we have been wrong. And just as God provided Abraham with the sacrifice that he truly desires, God has again shown us how we ought to express our desire for relationship with the divine. Cut to the Last Supper, three or four days before the first Easter. On this night Jesus breaks apart the meal that he and his disciples are eating. "Take, eat; this is my body. . . . Drink ye all of it, for this is my blood." On this night Jesus again turns the sacrificial meal around. Like the ram, this meal is provided by God; like the ram, it is God seeking relationship with us rather than the other way around; but unlike the ram, this time God is offering himself as the sacrifical meal. There is more though: the sacrificial meal is not necessarily one shared between God and a person, but it is rather God as the sacrifical meal shared among disciples. In essence, to have a relationship with God one must have a relationship with others. Or in other words, God is worshipped through the relationship with others. While they ate this meal together Jesus taught, "A new commandment I give unto you, That ye love one another; as I have loved you, that ye also love one another." He then prays: "As thou, Father, art in me, and I in thee, that they also may be one in us. . . . that they may be one, even as we are one: I in them, and thou in me, that they may be made perfect in one; and that the world may know that thou hast sent me, and hast loved them, as thou hast loved me." On this Easter weekend, perhaps we need to set aside the sacrificial tendences of false worship and work harder to love one another. Perhaps we need to strive harder to come together as one, rather than cut up the body of Christ anew to prove our devotion. Perhaps we need to be a little less like Abraham with the righteous courage to sacrifice others, and more like God with the loving desire to sit down and have a meal together. Despite their failure at being good at basketball, I am still--and will probably be until the day I die--a loyal and loving fan of the Utah Jazz. This does not mean that I won't call out their mistakes, wish for roster changes, throw my hands in the air at terrible plays and missed layups, or hope for a change in the coaching staff. It means that I have a hope--a sometimes very slim hope--they can again achieve their imperfect but nevertheless enjoyable days of glory. Some say it will never happen, but right now I choose to believe in miracles. 1. Adopt cultural practices (the World). 4. When 'Eternal Doctrine' is obviously antiquated/bigoted/absurd in comparison to societal progress, quietly rename 'Eternal Doctrine' to cultural practice. If a tree falls in the woods and nobody is there to hear it, does it make a sound? There are a few different ways to answer this elementary question. First, one could say that the sound of a tree falling is simply vibrations in the air caused by the tree interacting with other trees and the ground, and thus it makes a sound regardless of whether or not someone is there to hear it. A second answer to this is to say that sounds are not the vibrations in the air, but are rather the phenomenological experiences that results from those vibrations interacting with complicated structures of the inner ears and traveling to the brain as nerve signals where those signals are transformed into what our minds experience as sounds. Thus, without any ears and brains to receive and transform those vibrations in there air, there are no sounds resulting from the falling tree. A third answer builds on the second, but instead focuses on the sound of a falling tree. Even if an ear and brain are present to receive and transform those vibrations to a phenomenological experience, there still remains the ability for the sounds of a falling tree to be heard as such. This requires both distinguishing and identifying the sound. The forest contains a blend of vibrations from rustling leaves and branches, chirping birds, rushing rivers, animal calls, wind, etc. Together these bombard the ear and brain as a chaotic mess of vibrations. It is only through time and experience that our brains begin to distinguish one set of vibrations from another (which begins in the womb). Furthermore, as time and experience enable the vibrations to be distinguished, more experience and and instructions (both self-taught and from others) enable us to identify the sounds we are hearing. What entered our ears as unorganized/chaotic vibrations are able to be experienced as organized and ordered sounds. In the forest we can hear, not just sounds, but the sound of a falling tree, the sounds of rustling leaves, the roar of the river, and the chirping of individual birds as if they were each happening in isolation. This brings me to divine creation and the purpose of this post. In early and even contemporary Mormonism, certain Mormon thinkers criticized and mocked the notion of creatio ex nihilo or creation out of nothing, calling the creation of something out of nothing to be nonsensical--and they did so with the odd assumption that it made more sense to understand God as creating the world with chaotic stuff by speaking to rocks that listen and obey, or angels manufacturing the objects of the world with their knowledge of chemistry. To be honest, I find theories like the Big Bang and natural selection to be far superior and adequate at explaining the existence of objects in the universe and world. In fact, I feel confident in saying that if someone rejects those theories they can only do so out of ignorance or harmful religious fundamentalism. Many religious scientists who accept cosmological explanations of the universe or evolutionary explanations of life do so with the caveat that those are tools by which God created those things. Such a view, however, is unnecessary and should be rejected, simply because one of the key explanatory values of these theories is that they do not require any deity or higher-being to operate. They are self-sufficient in explaining the existence of the physical state of things in a purely atheistic universe. Does that mean that I am saying that God did not create the universe? No. Those of you who have followed my philosophical/theological pondering know that part of my project has been to rethink religious language about the divine, understanding them more in terms of divinity than in term of anthropomorphism. For example, eternal life is a type of life, not just more of it; and God's power is a type of power (specifically, love), and not just abilities of a Supersupersuperman. Similarly, I believe we should understand God's creative ability as a type of creation, and not just the creative abilities of a steroid-induced artisan. In other words, God's creative act is not analogous to a potter working unorganized clay into a new physical thing, but is instead His imbuing purpose and meaning into an already existing universe of things. Just as the forest without distinguishing and identifying brains contains a chaotic and seemingly incongruous mess of vibrations in the air, the physical universe--as it presently is--is chaotic and unorganized in itself. The physical universe does not distinguish rock, from mountain, from ant, from ice, from star, from human baby, from good, from bad. Those are things that we do (as well as other brained-animals to a certain extent). Using the tools of experience and science we organize the world by distinguishing and identifying those things that we distinguish. Without humans and god, the world of things would still exist. There just wouldn't be anybody around to point at it, saying, "This is a rock," "This is ice," and "This is a baby." This type of creation by organizing that which is inherently unorganized is similar to, but not wholly analogous to, God's creative act (even though one could read this into the Genesis 1 account of creation). Rather than simply organizing the unorganized product of cosmology and natural selection by distinguishing and identifying its parts, God's creative act is a type of organization that only God can do. His act was to imbue the whole with purpose and meaning. To talk about God creating the universe should not be a discourse on the origin of things (including Homo sapiens), but the recognition of the purpose of the universe. At its religious heart, to say that God created the universe is not to say that the universe of things would not exist if there were no God, but is to evoke the purpose and meaning that the universe and ourselves have been given. Spent much of the last week putting together a new site to replace the bland one that had been up for a few years. For the rest of the month you can use the discount code MORMONSTUDIES to get 20% off your order. 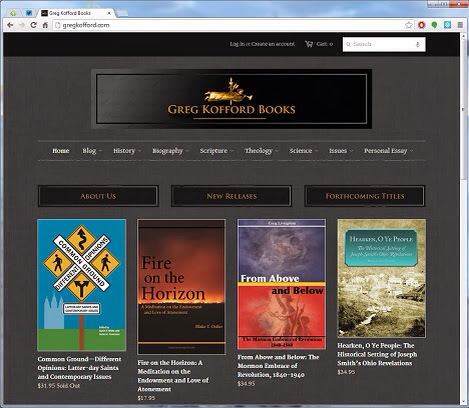 Go buy some books at www.gregkofford.com and help me feed my children. I am so thankful for all of the support I have been receiving the past few weeks. This has certainly been a challenge, and I do not think I would have been able to handle it in the way that I have without the dozens of emails, messages, phone calls, comments, etc that I have received. However, along with that support so many people have shared similar painful experiences that they have either experiences or are experiencing today. In some ways, reading these accounts have been more painful than what I have been going through myself. Too many friends, family, and acquaintances--too many good and faithful saints--are suffering because of the (usually) well-meaning but ignorant actions of local leaders. It has been a comfort for me to know I'm not alone, and I know it has been a comfort to others to know that they are not alone either. The problem is that I should be alone in this. This (or similar acts) should not be a recurring problem in the Church. I should be alone in facing the hurtful acts of a rogue local leader, but I am not. I wish I could just cast the blame at my local leaders (and my own naivete), but I cannot. This is not to say that the corporate leadership of the Church is behind the actions (which I do not think they are), but rather that the bureaucratic organization of Church leadership, the cultural perception of an infallible Church, and the failure of leading Church authorities to address these problems are the root causes of these acts. I'm so torn between my love for the Church and for the potential that I see in it, and my exhausted desire to just walk away from it. "I work so hard at trying to stay in the Church. Really hard. More often than not I feel like I don't fit. This just feels like I am being pushed out. I am tired of fighting, of trying to be careful to say the right thing in the right way so that my voice is heard but I am not rocking the boat too hard, and I am so tempted to walk away from a community that frustrates me yet that I love. "I am trying to reframe this and I am having a hard time with it. It isn't just this one incident. It's like this has been building for so long and I have been trying so hard and this is the breaking point. Right now I feel like I can't be who I am, and believe how I believe, and still try to be a part of the Church. I have spent the last two months reading and studying the words of Christ in the four gospels. I don't understand how I have been teaching anything different than what I have been reading about in the scriptures. "I keep trying to adjust my perspective but some of the things I am most passionate about are being smashed . . . my emotions are screaming at me because of the way I am being treated. Rereading this is bringing tears to my eyes as I type (largely caused by a sobbing gene that I inherited). I could have written this myself, as could so many good, faithful saints. My heart is aching so much, not just for myself, but for so many that are hurting so much right now--especially for so many out there who do not have this enormous circle of support that I have found. In it's desire to love the 99, the Church is utterly failing the 1.